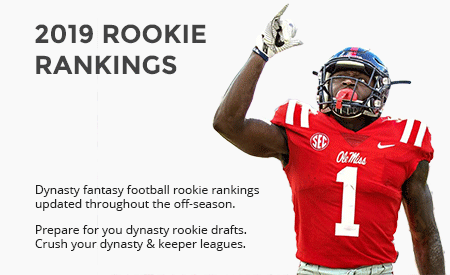 Our look at the top 100 standard dynasty rankings continues. In today’s edition of Standard Dynasty Rankings, we have the perfect blend of proven veterans and promising youth. With three players age 29 or older, and a trio of players age 22 or younger, there are several great options for contenders and rebuilders alike. It’s important to remember a couple of things as we reach these parts of our rankings. For one, none of these players are ranked in the top 50 for a reason. Whether it was age, lack of consistent production, or injury history, these players aren’t exactly elite. On a more positive note, these very players in the 60-100 range are arguably the most important when crafting our dynasty rosters. If we can find a few reliable long-term starters, we set our teams up for tremendous success. 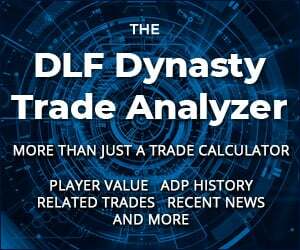 Let’s get into 61-70 of our Standard Dynasty Rankings! Extrapolate Will Fuller’s ten games to a full season and his numbers are pretty intriguing. 675 yards isn’t anything special, but I think we all know that 11 touchdowns is. Set up across from DeAndre Hopkins with Deshaun Watson throwing him the ball, I think Fuller’s set up for several bright years. What we need now from him is consistency. Yes, we don’t care a whole lot about receptions in standard scoring, but we still want our players getting the ball in their hands. With only 75 receptions in 24 career games, that’s definitely something I’m looking for Fuller to improve on. Hey, how much higher does Kupp go than #67 in PPR rankings? Hey Johnny! Thanks for the comment. In the officiall DLF PPR Rankings, he’s at 65, which isn’t much higher. I would probably place him around 60, which would be a significant boost. Kupp’s 62 receptions in year one were pretty good. I’m hoping to see him hit 70 or 80 in 2018 though. Thanks for the comment, Johnny! Hope this helps. Not high on Njoku at all.. Wayy too many mouths to feed in CLE.. How do you value him compared to Ebron and Brate? Because i’d rather either. Hey Leonard, thanks for the comment! I totally understand your concerns with Njoku. Cleveland does have a ton of great weapons, but I do believe that long-term, he’ll be a consistent threat to be a TE1. As for Ebron and Brate, I’m going to have to respectfully disagree. I think they’re both pretty solid talents, but neither of them is the unquestioned starters for their team. Brate has OJ Howard to deal with and Ebron has Jack Doyle. They’re both fine football players. But both in the short and long-term, give me Njoku. Thanks for reaching out, Leonard!